In an effort to promote inclusivity and diversity on campus, the Office of Pluralism and Leadership has launched a pilot peer education program called OPAL Ambassadors. The program started in late March and consists of six student ambassadors, Brandon Yu ’20, Carolyn Musyoka ’20, Hugh Mac Neill ’20, Io Jones ’19, Rachel Muir ’20 and Sharon Cho ’17. They were selected based on leadership skills and experience with inclusivity, according to program coordinator for Gender and Sexuality Diversity and Multicultural Education Sebastian Muñoz-Medina. The ambassadors will work with OPAL on activities such as facilitating peer workshops, creating electronic campaigns and educating others on bias incident reporting, among other responsibilities, with the main focus being to encourage diversity and inclusivity. They added that the Ambassadors program is starting out with a small group of students to gauge students’ level of commitment and see how the student body reacts to the program. Muñoz-Medina said that before they started the group they had been doing workshops and facilitating conversations without much involvement from students. Muñoz-Medina said that the program was created to give students more agency in conversations about identity. Muñoz-Medina added that when students are facilitating discussions instead of staff members, it allows for organic conversations in which students are more willing to be vulnerable with each other. OPAL Ambassador Brandon Yu ’20 agreed with Muñoz-Medina, saying that the students bring a level of relatability that is needed in sensitive discussions that professional staff members cannot always necessarily provide. Yu’s motivation for becoming an OPAL Ambassador related directly to his Asian-American identity and experience coming to Hanover from the West coast. Yu said that he has always faced questions about identity on campus because his hometown has a diverse distribution of socioeconomic classes and backgrounds, which for him differs from the College. Yu realized that OPAL is an underutilized resource on campus and said he became an ambassador to raise awareness about OPAL’s resources. The group has held several events already, including a tabling event at Novack Cafe in which students wrote on whiteboards why they think inclusion, diversity and OPAL were important to them and the College, Muñoz-Medina said. The ambassadors took photos of students standing by the whiteboards as part of the photo campaign the group is leading. Muñoz-Medina said that the group plans to conduct similar tabling sessions throughout the term and will have a display of the projects at the end of the term. 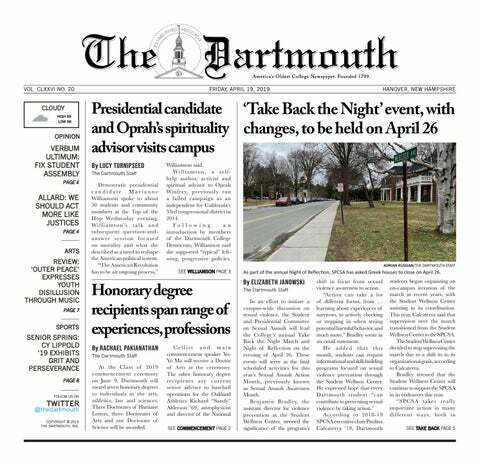 The group is planning workshops with sports teams, Greek houses and other groups such as the Dartmouth Outing Club at these groups’ request, OPAL ambassador Rachel Muir ’20 said. She added that these workshops focus on historically underrepresented identities and backgrounds that are not frequently discussed on campus. The ambassadors are being trained for a special workshop that promotes speaking out against bigotry. They are also currently planning a tabling event for Dimensions and a PRIDE cookout event, Muir said. The group will also have a crossing-the-line activity event, which involves people repeatedly crossing a line if they have had a certain experience, where anyone can come and participate, Muñoz-Medina said. Instead of partnering with a host organization to plan this event, the OPAL Ambassadors will be conducting this event on their own. They added that the ambassadors will be working around themes such as PRIDE week and Asian and Pacific Heritage month, both currently happening, to help increase education about certain communities and issues. The group also held an event called, “OPAL Ambassadors: Speed Chats,” in which students could come, be themselves and have conversations about what was on their minds, Muñoz-Medina said. They added that the ambassadors will likely repeat the event because it is an accessible way to spark dialogue between students. OPAL Ambassador Hugh Mac Neill ’20 first became active with OPAL because he found that there were not many spaces for LGBTQ students on campus. OPAL helped him to restart the Spectra club for LGBTQ students, and he has now joined the Ambassadors program to focus on discussions around sexual identity on campus. Muñoz-Medina said that ambassadors are currently being trained in the areas of inclusivity and diversity before they can begin leading workshops. They added that the program will open up spots every term for students to apply and they expect that the program will only expand from here.